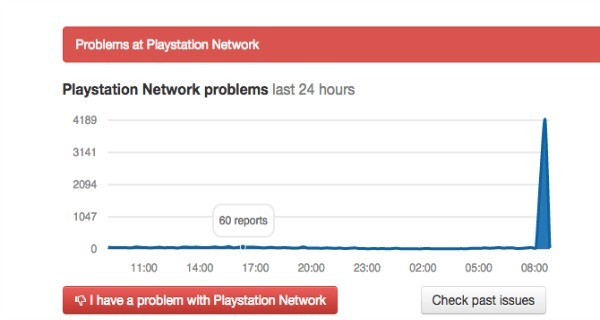 If you woke up this morning and found that you were having trouble connecting to the PlayStation Network, well, you’re not alone. PlayStation appears to be having more than a few issues again this morning and players aren’t happy. According to VentureBeat, the outage that spans across the world is keeping players from being able to log in to play games or use apps on the PS4, PS3 and PlayStation Vita. This doesn’t only affect gaming, so if you were gearing up to buy a game or movie from the Store today, well you’re out of luck. Players get an error message whenever they try to connect. The official website for the Network status shows a spike in reported outages. There isn’t any clear information on why PlayStation Network is experiencing problems, but hopefully Sony can update everyone later after it has been successfully resolved. The error shown on consoles is that PlayStation is undergoing maintenance, but is it really maintenance or is the network actually down for a different reason? Many players have taken to social media to loudly complain about the outage. Others have been vowing that it might just be time for an Xbox. And the complaints aren’t just simple little curses. Many people are considering switching consoles, dropping PlayStation altogether or even regretting a recent PS4 purchase. And these players have every right to voice their concern, because the thing about PlayStation Network is you can’t really do much without it. It’s the key to playing online multiplayer games like Battlefield, Call Of Duty and the new Star Wars: Battlefront. Without the network, those games, known for their online multiplayer, become a point of anger for many. And then, even some single-player games won’t work because of third-party connections. But in terms of threatening to switch to Xbox, you also have to understand Xbox has the same kind of outages. This isn’t just a PlayStation thing. It’s just a part of online gaming many have become accustomed to. We’ll keep you updated as more news rolls in and if you’re one of the lucky ones affected by the outage, hopefully it can get resolved soon.